Entrepreneurial professionals must develop a competitive advantage by building valuable skills. This book offers advice based on research and reality--not meaningless platitudes-- on how to invest in yourself in order to stand out from the crowd. An important guide to starting up a remarkable career. This book changed my mind. It has moved me from 'find your passion, so that you can be useful' to 'be useful so that you can find your passion.' That is a big flip, but it's more honest, and that is why I am giving each of my three young adult children a copy of this unorthodox guide. Stop worrying about what you feel like doing (and what the world owes you) and instead, start creating something meaningful and then give it to the world. Cal really delivers with this one. Do what you love and the money will follow' sounds like great advice -- until it's time to get a job and disillusionment quickly sets in. Cal Newport ably demonstrates how the quest for 'passion' can corrode job satisfaction. If all he accomplished with this book was to turn conventional wisdom on its head, that would be interesting enough. But he goes further -- offering advice and examples that will help you bypass the disillusionment and get right to work building skills that matter. Not sure about my career path specifically but truly to understand your own personal power--sure, read the success doctrine books to inspire you. But one book I give to people to balance out all those is So Good They Can't Ignore You by Cal Newport. 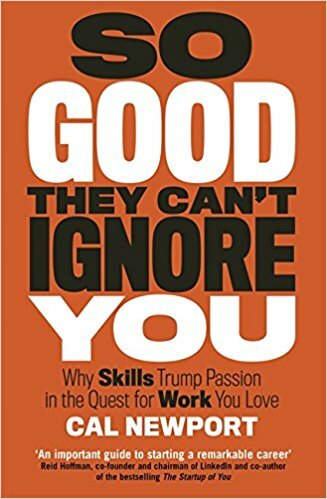 The subtitle says it all "Why Skills Trump Passion in the Quest for Work You Love" I think what is lost in many success books is the utter honesty that to be good at something, you really have to invest time and effort. The universe will not conspire in your favor unless you do so. You can't magically conjure up work that you love. Passion gets you to a certain place, then it's just old fashioned "work" that moves you forward. This is also a great book for entrepreneurs who have found their "passion" but there are days when you need more than that passion to keep going. The best book I’ve read on career planning and management. Don’t follow your passion. Follow whatever you’re so good at that they can’t ignore you — this is the premise of Cal Newport’s book “So Good They Can’t Ignore You”, and I highly recommend reading this one as well. As Dr. Newport (who is not only an excellent author but also a Computer Science professor at Georgetown University) says, being satisfied with work is connected to passion, which in turn is related to intrinsic motivation. Three essential components of intrinsic motivation are autonomy, competence, and relatedness. You should feel you have some sense of control over your time, that you’re good at what you do, and finally, you should be able to relate to others in the process.